Neuroimaging modalities like fMRI have begun to uncover the brain areas that are dysfunctional in disorders like depression. Non-invasive neuromodulation technologies like transcranial photobiomodulation allow us to target those brain areas for new treatments. tPBM is such an easy and cost-effective form of neuromodulation that the technology could be scaled rather quickly. In late March 2019, we reached out to Prof. Jay Sanguinetti Ph.D. Prof. Sanguinetti’s research focuses on neurocognitive applications for clinical non-invasive treatment and neuroenhancement. Despite his full schedule, he agreed to answer a few questions and elaborate more on his groundbreaking work. In his answers, Prof. Sanguinetti highlights the opportunities that photobiomodulation (PBM) and, specifically, transcranial photobimodulation (tPBM) present to modern neuroscientists. You will sense considerable potential, hope and pride for his field of research and his work in Sanguinetti’s words. Perhaps, these feelings come through because this researcher’s journey can lead to significant discoveries and advancement of non-invasive treatment modalities. Furthermore, applications for such potential discoveries can be numerous, as you will find out from the interview below. Q: It looks like your primary interest lies with research in neurocognitive applications. What attracts you to this field, and why do you think it is worth pursuing? A: My interests are in two broad categories, clinical treatment, and neuroenhancement. Neuroimaging modalities like fMRI have begun to uncover the brain areas that are dysfunctional in disorders like depression. Non-invasive neuromodulation technologies like transcranial photobiomodulation allow us to target those brain areas for new treatments. This is exciting because it gives us a level of specificity that phrenological interventions cannot. I’m also interested in using non-invasive neuromodulation for neuroenhancement. For example, imagine that you could use a simple and safe device that allowed you to learn the piano or how to meditate twice as fast without any side effects. I think that would be worth-while to create something like that! Q: In one of the descriptions of your interests, you prominently note the factor of non-invasive applications. Why non-invasiveness is so relevant and critical to your research? Why is it so important? A: Non-invasive neuromodulation means affecting brain activity with a wearable device. That’s in contrast to invasive Deep Brain Stimulation (DBS) where a neurosurgeon inserts an electrode directly into the brain. DBS works beautifully for disorders like Parkinson ’s disease and there is some evidence it works for depression and OCD. Although DBS is highly efficacious, it has a major drawback: It requires brain surgery! So, the major advantage of non-invasive technologies is that they may allow us to gain the power of DBS to treat neurological and psychiatric disease, but without going through the trouble of brain surgery. Q: You study various forms of non-invasive transcranial brain stimulation. How prominent is transcranial photobiomodulation (tPBM) with near infrared light (NIR) is in your work? What could you tell us about your research in the field of tPBM? What are the relevant applications for tPBM that you research supports? A: I am new to the transcranial photobiomodulation (tPBM) field. I became interested in how various forms of energy – mechanical energy, electromagnetism, light – influence neural activity, and I came across the fascinating field of tPBM. We have now completed a series of experiments using PBM to enhance learning in a healthy population of undergraduate students. Our goal is to use tPBM for neuroenhancement during learning tasks. We predict that tPBM could be used during the acquisition of new skills, to learn new information, or to perform better on tasks that require focused attention. We chose the Neuro Gamma device because it flickers the light at 40 Hz. Brain oscillations between 25 and 100 Hz are known as gamma oscillations and are related to higher-level cognitive functions like attention. They are proposed to be the neural correlate of consciousness. Currently, it is not known whether the flicker rate of tPBM can directly influence neural oscillations, but there are some promising pilot results that suggest that they might. Therefore, we selected the Neuro Gamma in an attempt to enhance cognitive performance on a learning task. If the experiment is successful, then the enhancement could be due to enhancement of cellular function (the basic mechanism of tPBM), due to the influence of neural oscillations, or both. Q: These days you are conducting a very interesting study involving the military. In this study, you are employing Vielight devices to test their effect on your subjects. What can you tell us today, considering that the study is still ongoing? 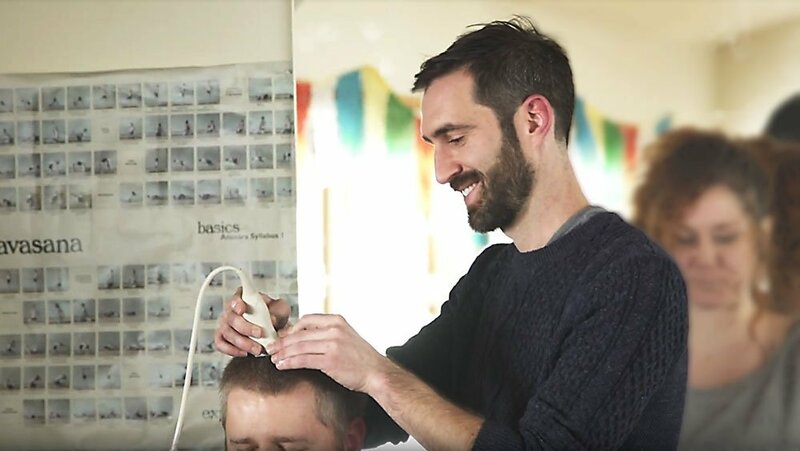 We are using a task that Dr. Vince Clark has previously used with another form of non-invasive neuromodulation, transcranial direct current stimulation (tDCS). Dr. Clark has previously shown that just 20 minutes of tDCS doubles the learning rate on the threat-detection task. This result has been replicated in his lab and others. Thus, we have a nice baseline and experimental paradigm to compare our tPBM results with. One nice thing about using this paradigm is that we know how big the effect size is with tDCS. This fact will allow us to directly compare the size of our effect with tPBM. Q: I understand that you are also looking into researching the effect of transcranial PBM on meditation. Can you describe your experience? What are you looking for? What do you think is the future of tPBM in meditation, and improvement on a person’s well-being in general? The latter is the subject to validation studies, of course. A: Yes, this is a new area and we are actively planning several experiments. So far, we have used tPBM in pilot experiments, so I am unable to say much. Given that caveat, we have had several advanced meditators report positive effects with tPBM. The meditators claim that the device helps them to enter a focused, calm, or detached meditation state that is consistent with their practice. Based on these self-reports, we are designing experiments to validate these claims empirically. If tPBM can help meditators benefit quicker from their practice, there will be many practical applications. Meditation has many positive benefits that are supported by scientific research, including interventions for neurological and psychiatric disease. However, it often takes immense effort and practice to reap the benefits of meditation. Thus, tPBM may help meditators experience the benefits of meditation quicker. This factor would lead to positive effects for the regular meditator as well as for the clinical populations. 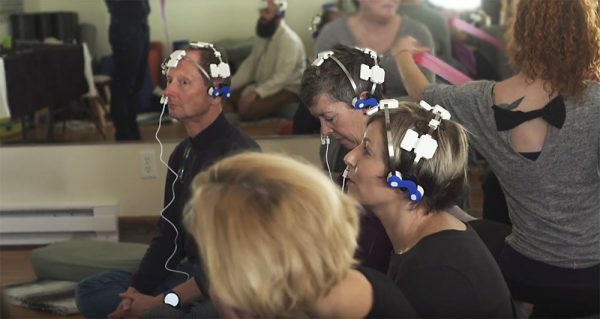 One interesting thing is that several papers have shown that meditators enhance their gamma brain oscillations (that I discussed above) while they are meditating. In fact, the more someone meditates, the bigger the gamma effect becomes. This may be due to the way meditation enhances the control of attention, or how it generally alters consciousness. Both of which are related to gamma oscillations. Since gamma oscillations are related to meditation and mindfulness, we predict that the Neuro Gamma should enhance mindful awareness. However, gamma oscillations occur in the range of about 25 Hz to 100 Hz or more. Thus, we asked Vielight for a tPBM device that would give us control over the flicker rate. We acquired such a device from Vielight and are currently testing frequencies from 1 Hz to 120 Hz on meditators. So far, as you may expect, meditators like frequencies above 40 Hz, especially the higher frequencies. This is an exciting area of research, and we hope to validate the self-report claims soon. Q: What are you next near-term and medium-term plans and hopes for your research in general and PBM research specifically? A: If the research supports the use of tPBM for clinical applications and neuroenhancement, then I plan to make this a large part of my research agenda. tPBM is such an easy and cost-effective form of neuromodulation that the technology could be scaled rather quickly. For example, imagine that tPBM could help meditators learn meditation skills quicker. We could use this could as a clinical intervention. We could create a package and give it out to clinics rather easily, which could help reduce suffering on a large scale. However, first things first, – we must do the science to know how effective tPBM combined with meditation is.